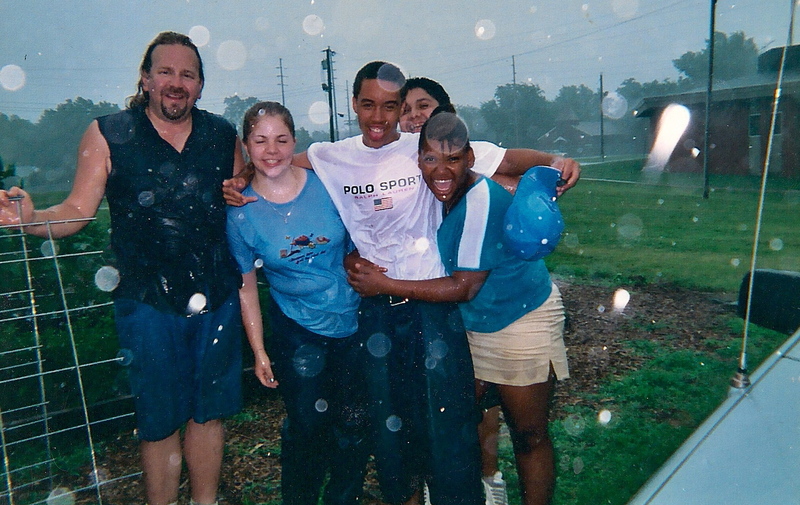 The Youth Leadership and Development Corps, caught in a summer rain storm. The KCK Organic Teaching Gardens are supported by The Youth Leadership and Development Corps where High School Students from JC Harmon, Schlagle, Sumner, Washington and Wyandotte High Schools work after school, 3 or 4 days a week, between the hours of 3:30 pm and 5:30 pm, and during the summer months, 2 or 3 days a week. This team of students help to maintain the gardens, with watering, weeding, working the compost system, preparing fresh foods for workshops, and conducting garden workshops for younger elementary students in after-school programs. In this picture, Garden Coordinator Mark Manning and High School Apprentices: Bobbi, Anthony, Manuel, and Brittany get caught in a summer rain storm, while working in the Quindaro Elementary Garden.